Mexico is a vast and biologically diverse country, covering more than 761,600 square miles. It encompasses numerous ecosystems, from desert in the north to tropical rain forests in the south. The many habitats of Mexico are home to 10 percent of the world's biodiversity, according to Viva Natura online database, including a huge variety of flowers. Tropical, temperate and desert flowers can be found throughout the country, many of which are commonly grown in gardens around the world. 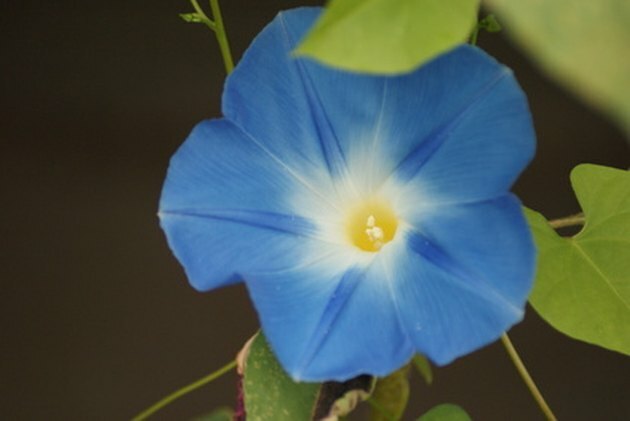 Morning glory is a common Mexican flower. Mexican sunflower (Tithonia rotundifolia) is an annual native to Mexico and Central America. It thrives in full sun and scorching heat, requiring little water or care. Upright and bushy with handsome blue-green foliage, this species is a nice addition to full-sun gardens even when not in bloom. Reddish-orange, zinnia-like flowers emerge in June, sometimes with a second bloom in September. Mexican sunflower can grow up to 6 feet tall with a 2-foot spread, so it requires extra room to flourish. Native to central and southern Mexico, common morning glory (Ipomoea purpurea) is a twining vine that can exceed 9 feet in height. In its natural habitat, this species occurs in rich, organic soil with constant moisture, such as along waterways or wooded areas. Once established, morning glory overtakes its growing structure, forming a thick curtain of heart-shaped leaves along thin wiry vines. Flowers appear in early summer and bloom until fall, producing masses of trumpet-shaped blossoms in varying shades of blue and purple. Found in pine and oak forests throughout Mexico and Guatemala, pineapple sage (Salvia elegans) prefers elevations above 8,000 feet. It is named for the scent of its leaves, which strongly resembles fresh pineapple. Technically a subshrub, pineapple sage is a woody perennial plant with an open, 5-foot-tall growth habit and fuzzy light-green leaves. It has tubular, scarlet-red flowers that resemble those of other salvias. Perfect for sunny beds, pineapple sage thrives in drought conditions and will bloom prolifically if frequently trimmed of dead flowers. Mexican honeysuckle (Justicia spicigera) is a moderately spreading evergreen shrub found throughout southern Mexico. The long, oval-shaped leaves are bright green and slightly velvety with moderate veining. It can bloom for up to nine months in warm areas, producing rounded spikes of tubular, bright-orange flowers that are attractive to hummingbirds. Although it can tolerate cold temperatures, heavy frost will destroy its foliage, but growth returns quickly as the soil warms. White laelia (Laelia albida) is the smallest laelia species in Mexico, native to western Oaxaca. It is a dainty epiphytic orchid found on tree trunks throughout coastal oak forests above 3,000 feet. The foliage is fleshy and dark-green but scant, with only two or three leaves per plant. In late fall and early winter white laelia sends up a slender stalk, where two to nine flowers emerge. The flowers are small, fragrant and delicate with creamy-white petals accented by a splash of yellow on the lower lip.